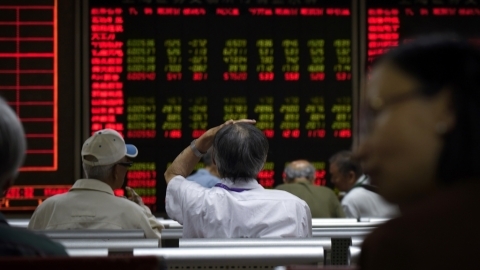 Clouded by a big overnight crumble on Wall Street, China’s markets fell sharply yesterday — with Shanghai hitting a four-year low. The main indexes in Shanghai and Shenzhen tumbled more than 5 percent and more than 1,000 stocks fell the daily 10 percent limit. The Shanghai Composite Index slumped 5.22 percent, or 142.38 points, to close at a four-year low of 2,583.46 after the biggest single day loss since February 2016, according to Wind Information, a Chinese financial services firm. The smaller Shenzhen Component Index fell by 6.07 percent to finish at 7524.09 points, while the Nasdaq-style ChiNext enterprise board declined 6.30 percent at 1261.88. Dragged by the panic overwhelming the Wall Street and the Hong Kong markets, the A-share market opened lower and continued to drop during theday, resulting in more than 1,000 stocks suffering sharp declines. Overnight on the US stock markets, both the Dow Jones Industrial Average and S&P 500 posted their largest drops since February, while the Nasdaq recorded its biggest single day sell-off since June 2016. Communications equipment companies, securities brokers and domestic chip makers led the losses in China, with shares of HNA Technology, a firm engaged in the operational management, strategic investment and innovation in areas of cloud computing, big data and artificial intelligence, slipped by the daily maximum limit of 10 percent to close at 3.38 yuan(US$0.49). Analysts pointed out that the slump in the A-share market was mainly triggered by the drop in the US and Asia-Pacific markets. Credit Suisse said that the Chinese stock market is poised for a technical rebound in its latest research note.